This is slightly embarrassing, but when I was a kid, for a short while, I was a Bop It master. I would go for hours, never missing a beat, and I think my longest stretch only stopped because I really needed to pee. Suffice to say, for a very brief stretch of my childhood, Bop It was a minor, but intense obsession, so I was both intrigued and a little confused to see it show up in the App Store. For those fortunate few who have never encountered this rather loud and frequently obnoxious toy, it usually comes in the form of a molded plastic device with a bunch of zany attachments that you can either twist, pull, bop, or what have you. The game part of it takes a couple of different forms, but the most basic one is simply following the instructions. A hyper-active surfer dude voice will tell you to “Bop it!” or “Twist it!”, and your job is to comply as quickly as you can. Surfer dude will keep going, getting faster and faster as time passes, until you mess up and surfer dude either praises or mocks you relentlessly. Now, a big part of the traditional Bop It’s appeal is in all the colorful and crazy thingamabobs sticking out of it. As you might have guessed, the iPhone has none of these, so the developers decided to get around this by, uh, displaying them on the screen. So instead of flicking a random plastic doohicky around, you get a more complicated version of Simon. 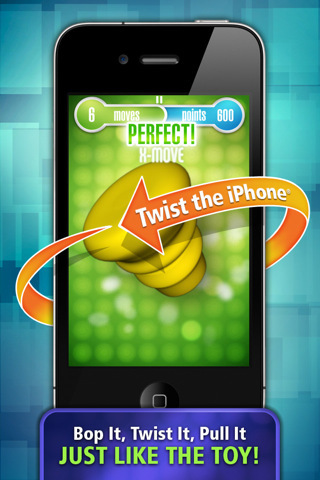 To be fair, they’ve tried to integrate accelerometer controls in addition to touch controls in an attempt to more closely mimic the actual toy, so you can twist your iPhone instead of just twisting your fingers on the screen, but unfortunately, neither of these control schemes works very well. The touch sensitivity is spotty at best, sometimes requiring very awkward two finger motions that only register some of the time, and the accelerometer controls are even worse. I also wouldn’t be surprised if Bop It app owners end up with a high rate of phone damage, since trying to quickly pull, twist, and flick with the tilt controls can only end badly. That said, a lot of work has gone into giving the app a lot of additional features and “Bopjects”, a vile term the world could have gone without, and there are quite a few different solo and multiplayer modes to keep you busy. There are also multiple trophies to unlock, as well as local and global online leaderboards, but strangely enough, the only social network available is Facebook. Given the competitive, high-scoring nature of the game, I would have assumed some kind of online match system would also be included, but while there is a local head-to-head option, online matches are currently a no go. I won’t deny that Bop It has a very clean user and kid-friendly interface, and it can be fun, if rather hyperactive, but the overall experience is undeniably awkward on the iPhone and it’s a far cry from the toy’s humble, molded plastic origins. 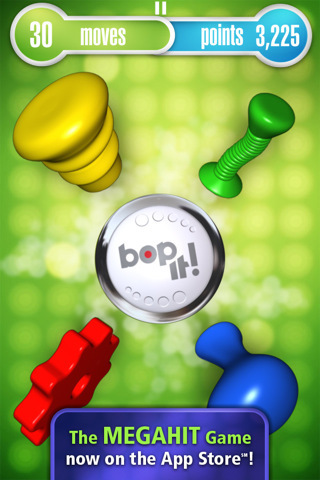 AppSafari review of Bop It! was written by Tracy Yonemoto on February 4th, 2011 and categorized under Action, App Store, Games, Physics Based. Page viewed 4459 times, 2 so far today. Need help on using these apps? Please read the Help Page.